Watford had to settle for a draw at Fulham after Aleksandar Mitrovic struck late on to earn the hosts a point. The Hornets punished a poor start by Fulham as Andre Gray sidefooted home inside 90 seconds and the visitors, who won their first four Premier League games of the season. Dominating the first half, Gray was denied by Fulham goalkeeper Marcus Bettinelli either side of the break and Watford paid for their wasted chances as an improved second-half performance by the hosts saw them draw level through Mitrovic’s equaliser on 78 minutes. Burnley finally got their first win of the season, they were 2-0 up by half-time, with goals in quick succession from Matej Vydra and Aaron Lennon just before the break. Bournemouth dominated in the second half, but Burnley substitute Ashley Barnes converted after Johann Berg Gudmundsson hit the post to extend the lead before adding his second just before the end. Burnley’s win, their first in 10 league games, moved them up to 16th in the table while Bournemouth dropped to seventh place. Manchester City thrashed Cardiff City to make amends for their home Champions League defeat in midweek. Cardiff has not yet won a game all season and now find themselves second from bottom of the table. The bore draw of the week came at Crystal Palace, Palace had the best chances at Selhurst Park with skipper Luka Milivojevic’s first-half free-kick hitting the post, while Mamadou Sakho somehow failed to find the target from a header at the far post with the goal open, Newcastle, who hung on in the closing minutes, created little. Spanish attacker Ayoze Perez had their best chance when he fired a shot at keeper Wayne Hennessey following a defensive mistake by James Tomkins in the opening half. The draw means Newcastle move up one place to 18th with two points from six games and the Eagles remain in 11th with seven points. Second-half goals from Maddison and Jamie Vardy saw Leicester bounce back from two consecutive defeats and claim their third win of the Premier League season. Huddersfield took an early lead when Mathias Jorgensen squeezed the ball past Kasper Schmeichel from close range after a flick-on from Laurent Depoitre. But Leicester hit back with a well-executed counter-attacking goal from Kelechi Iheanacho as Huddersfield committed men forward in search of a second. The hosts dominated possession after the break and took the lead when Maddison stepped up to fire a free-kick into the top corner from 25 yards after a foul on Nampalys Mendy. The Foxes then took charge, Vardy rounding off an impressive performance by bursting through on goal before lifting the ball nonchalantly over Terriers goalkeeper Jonas Lossl. The victory sees Claude Puel’s men move into eighth, while the Terriers drop to the foot of the table. Liverpool won a seventh straight game in all competitions from the start of a season for the first time in 28 years by easing past Southampton at Anfield. The Reds hosts took the lead after 10 minutes when Xherdan Shaqiri’s shot deflected off Shane Long and then Wesley Hoedt for a peculiar own goal. Joel Matip rose above opposing centre-back Jannik Vestergaard to head in Trent Alexander-Arnold’s corner and double the advantage. 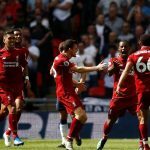 Liverpool added a third just before the break as Shaqiri’s superb free-kick came down off the crossbar and Mohamed Salah turned the ball in from close range. Klopp’s side goes back to the top of the Premier League with their sixth straight win. Manchester United manager Jose Mourinho says he expects more from his attacking players after they were held to a draw at Old Trafford by an impressive Wolves side. Joao Moutinho’s superb strike saw the newly promoted visitors continue their strong start to life in the Premier League. The Portuguese whipped in from the edge of the area as Nuno Espirito Santo’s team matched their hosts. Wolves were lively in the first half and unlucky to go behind as Fred netted his first goal for United, the Brazilian firing in from just inside the box after Paul Pogba’s excellent touch. United, with former manager Sir Alex Ferguson making his first visit to Old Trafford since having emergency brain surgery in May, was looking for a third straight league win. The hosts were on top after the break, but Raul Jimenez’s clever lay-off set up Moutinho for what was a deserved equaliser for the visitors. The draw keeps Wolves one point behind Manchester United in 10th, as Mourinho’s side climb to fifth. Harry Kane broke the deadlock in the first half of few chances, drilling in a penalty after a Glenn Murray handball. Substitute Erik Lamela scored their second to ensure there would be no repeat of their Champions League defeat in Milan earlier this week. Anthony Knockaert pulled one back in stoppage time but Brighton was unable to salvage a third straight Premier League draw. “The victory was so important for us,” said Pochettino. “We know it’s tough to play here. Brighton is a very aggressive team on set-pieces and they’re a team that works so hard. “But we worked hard too and played well in different periods of the game, “We were so aggressive and then with the ball we played some good football so I am happy with the three points. Blues boss Maurizio Sarri started his Stamford Bridge reign with five straight league wins but his team could not extend that record and had to settle for a goalless draw against West Ham, Pellegrini, in fact, it was West Ham who had the best chance and Chelsea were grateful for Andriy Yarmokenko’s glaring second-half miss, when he headed wide with only keeper Kepa Arrizabalaga to beat and the goal at his mercy, the visitors had chances of their own, with West Ham keeper Lukasz Fabianski saving well from substitutes Alvaro Morata and Ross Barkley, but in the end a draw was a fair result in a game that rarely sparked into life. Arsenal deserved this victory, Alexandre Lacazette swept a curling shot into the top corner from the edge of the area after Aaron Ramsey’s pass and shortly after, Pierre-Emerick Aubameyang poked in from close range after Mesut Ozil broke down the right, cut the ball back and Ramsey nudged it into the path of the Gabon international.